Woods Bagot and Buro Happold have invented a design program that helps architects and engineers create zero-emissions buildings. These days, progressive architects and engineers wax philosophical about bio-mass digesters, photovoltaics, and water recycling systems. But what is their effect, really? Will they truly make a difference? Woods Bagot, an Australia-based architecture mega-firm, and Buro Happold, a British giant in architectural engineering, have teamed up to produce Zero-E, a system for modeling building performance that might help architects understand the precise effects of all the eco-bling that they add to their buildings. 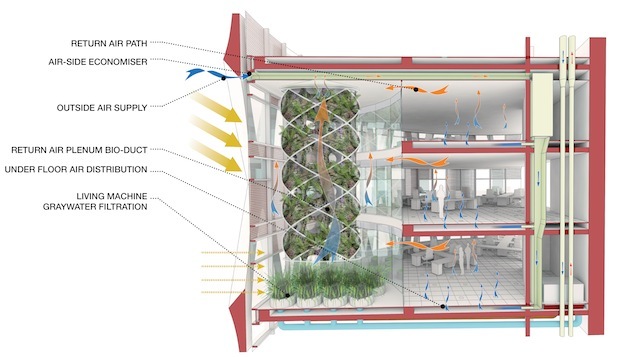 While systems like this already exist for building systems such as LEED, Woods Bagot claims that this is the first time anyone has developed something that integrates such advanced technologies–and tests them against the supremely rigorous standard of zero emissions. To that end, Zero-E helps designers and engineers design green-tech systems–such as photovoltaics, solar thermal panels, absorption chillers, biogas fuel cells, and anaerobic waste digesters–and see how they perform, virtually, in 3-D models. With Zero-E, designers can, for example, dial in requirements for energy use or water efficiency–and the program helps lay out the parameters for siting, building shape and orientation, and green-systems that would have to be layered on to achieve those goals. The standards for actually creating a zero-emissions building are rigorous: A building has to create more energy than it requires on an annual basis; it has to process it’s own waste and release only beneficial by products; release cleaner than it takes in; and supply 100% of it’s water needs through “closed loop” collection and recycling systems. The system was tested on the hypothetical mixed-used complex located in Chongquing, on the Yangtze River (pictured here). Buro Happold and Woods Bagot now plan to take Zero-E on the road, working with partners to apply the modeling system–and its suite of engineering solutions–to new buildings.